Another piece by one of my world’s favorite peope: animator extraordinaire Warren Greenwood. 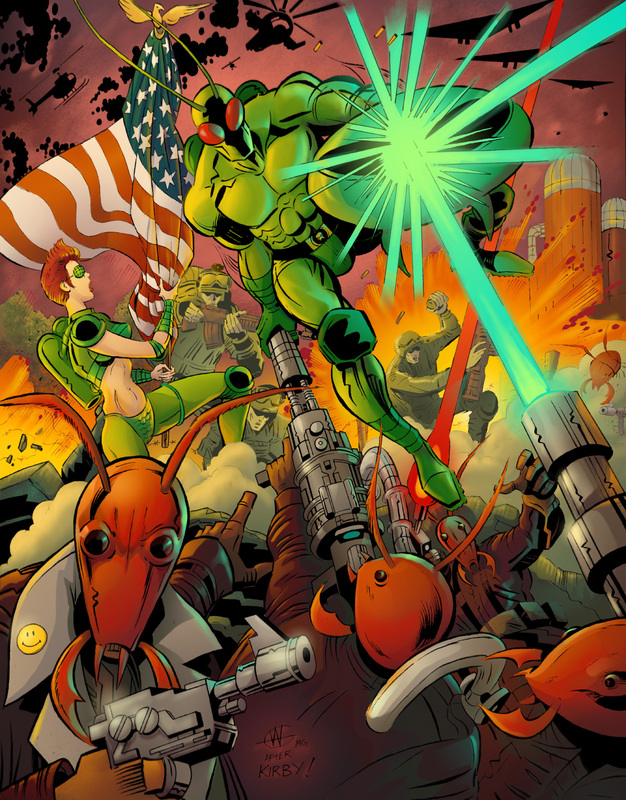 This one features Grasshopper and Cricket once more, in an homage to a famous Jack Kirby cover of a character who just so happens to be in theaters nationwide. (It was drawn years ago, though. So no accusations of attempting to hop on that gravy train, please.) When last we met our intrepid heroes, they were about to get busy in front of a waterfall. This time around, they’re doing battle with some dastardly ant-men! Again, forever do I struggle to not over render Warren’s work. How trying to do less work means I spend far more time doing said work is beyond me. But such is life. I was half way through another one of his pieces when I gave up out of frustration and moved onto something else. I will get back to it. I swear, Warren. I swear.